The Marden Walker Syndrom (MWS) presents itself in different forms and appears with different symptoms in the affected children.As a result you may well see MWS-children at the age of about 3 years walking while others of the same age with a physical handicap are unable to learn to walk. Some children speak a few words, others simply don’t to speak. Some children have physical problems, others none at all. My son’s handicap is quite severe and means he is confined to a wheelchair. Daniel is, for his age, small and very light, which is often the case with MWS. This is an advantage because it makes his care and carrying him a lot easier. Daniel’s facial expressions are only minimal or almost non-existent. He has a visual defect, which means his eyesight is so inhibited, that my son is, in accordance with German Law for the Blind, officially classed as being blind. The nutritional situation was, just as is the case with all MWS-children, very difficult. For this reason Daniel was fed intravenously via a tube through his nose. At the age of about 2 ½ years Daniel was able to handle the tube himself and, as a result, I decided to have a PEG (percutaneous endoscopic gastrostomy) implanted. This makes it possible for me to give Daniel enough food and drink without him having to have a tube up his nose. The PEG tube is implanted in the belly and has a life cycle of approx. 5 years before it has to be renewed. But the tube is now gone from his face and that is a totally new picture for me and my son. At the age of about 3 years, as we planned our first Dolphin therapy, we switched from the PEG to a button. This allows a patient to go swimming and can be changed by the person himself. A solution which I find to be a very good one. My son had very bad stump feet at birth and these were initially treated with plaster castes: unfortunately without success. At the age of 3 the feet were operated on in the University Clinic in Aachen, so that Daniel was able to stand on these. Daniel has pseudomotor contractions on his hands which means he is unable to move his fingers and as such his hands form a slight fist. 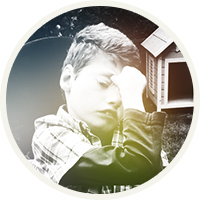 At the age of about 6 years Daniel developed an epilepsy, which has accompanied us ever since. At about the age of 7 years my son had an operation on his hips and my little boy had to lie in a plaster-cast bed for 6 weeks. A difficult time for all of us. Today at the age of 16, Daniel is, due to his serious physical handicap, unable to walk or sit. As a result, he has a wheelchair which is adapted to his needs. He has a light to strong scoliosis and kyphosis. He wears special made-to-measure shoes which help to maintain the results of his operation (on them). The nutritional side has improved a little, so that he now only needs his feeding tube for fluid intake. The biggest advances have been made by Daniel mentally. Were the doctors convinced in the first few weeks that Daniel would not understand anything, are we sure today, that Daniel comprehends the spoken word and is able to react to it – even bilingually, as Dutch is spoken in his school. Daniel clearly shows what he likes and dislikes. He likes music and can even laugh at himself. What my son doesn’t like at all is when people feel sorry for him or pity him. He takes part in life and comes to terms with his situation. He is fully a family person and happiest when all are around him. Daniel impresses me with his happy nature, his almost always good mood and his contentment. He shows us cleary that living a fulfilled life does not just depend on being fit and healthy, which are today´s ideals for “normality” and for living life in the fast lane. Some people have everything one could wish for in life and yet they can be unhappy and discontent. It is more important having the right attitude to one’s self and to life and having a family which is there for you and which it makes it clear that you are wanted and loved. Love is accepting someone, the way God meant him to be. If someone were to ask me today, whether I, with today’s knowledge and hindsight, would still choose to have a handicapped child I would answer with a clear „yes“. We have had to overcome many serious situations thus far and at times we were at our limits. I am lucky to have a family that from the very beginning accepted Daniel the way he is and supported us in every way possible. This is not just something that can be taken for granted. Daniel absolutely loves his grandma und granddad as well as both of his uncles. Without their help it would have been very difficult if nigh on impossible to have reached some of the goals we have managed to reach. Through Daniel I have met some very super people and deep friendships have resulted from these meetings. At times it hurts to see how other children develop and start planning their lives, the first girlfriend, receiving school certificates, passing A-levels, starting a traineeship etc. All that, however, does not play a role in our lives. At the age of 16 years my son is completely reliant upon help. Still we have enjoyed so many wonderful things together that I would not dare to forget. With a handicapped child things can’t be taken for granted and as such you take more intensive notice of what you do. The first 50 ml of food which he managed to drink (wow!). His first audible laugh (simply brilliant!). My little boy in water with dolphins (undescribable). My child reacts to light (I just can’t put the feeling in to words). Life with a handicapped child is definitely different to life with a healthy child, but in no way worse. In conclusion I can say “yes, we are happy.” I have a wonderful son. I am grateful for the years which we have been able to enjoy with each other and I hope that we have many more ahead of us. We are new entering a new exciting phase. With the beginnings of puberty it is not always easy for Daniel. He is just like other youth: nerved by his mother, who has to attend to his needs and he can’t simply lock himself in his room. At times this is a challenge for all concerned. Well, puberty just happens to be a time when parents become more difficult. But we will also overcome this phase. It will be interesting to see how our lives develop and what surprises Daniel holds in store for us in the future.